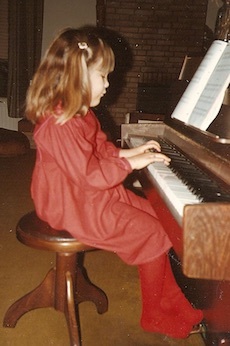 Laura Sandee (1978) started playing the piano at a young age of five. She won several prices at national competitions. She studied at the Royal Conservatory in The Hague (Holland) where she graduated with a Master of Arts in solo performance and chamber music in 2003. Her teachers were Rian de Waal and Håkon Austbø (from the Conservatory of Amsterdam). With the help of Håkon she developed special skills for interpreting Olivier Messiaen’s music. Since 2007 she is pianist of the contemporary music ensemble Insomnio. She has also performed concertos such as Oiseaux Exotiques of Messiaen, Birdconcerto of Harvey and Islands of Francesconi as soloist in the ensemble. In 2012 the ensemble played concerts in China and in the past they performed in England, Finland, Germany, Spain, Italy and France. Their First CD was nominated for the ‘Preis der Deutchen Schallplattenkritik’ in 2011. Together with her friend Anna van Nieukerken she founded The Sandee / Van Nieukerken Pianoduo in 2002. They play energic contemporary music and several composers wrote specially for this duo. They performed at Dutch festivals and festival Salihara in Jakarta in 2012. In 2014 they recorded Steve Martland’s Danceworks for BRAVA television. Laura also plays with the Askoschoenberg ensemble and the NNO (Orchestra of the north) in the Netherlands. She teaches at The Junior Department of the Royal Conservatory and she teaches students to play the piano as second subject as well. She lives in The Hague where she is also pianist of the Residentiekoor.